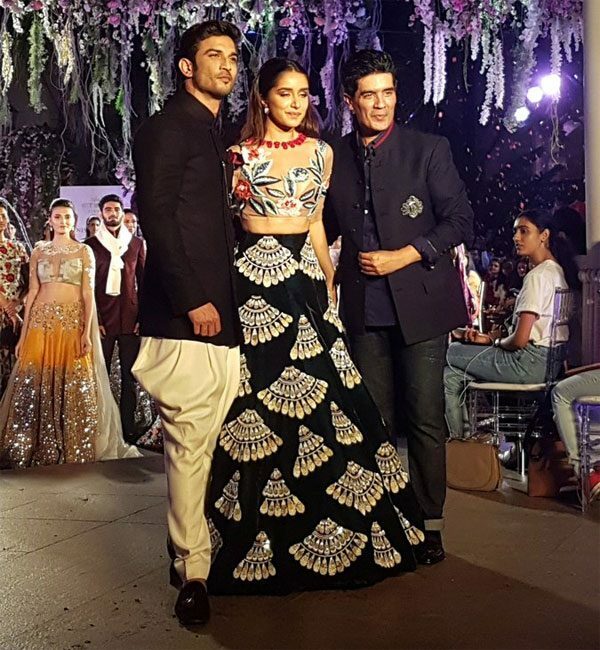 Sushant & Shraddha Steal The show at ‘LFK’ Lakme Fashion Week Gala Show :- After Tanu weds Manu queen Kangana Ranaut ignite the fire on the stage. This is the time for Sushant Singh Rajput and Shraddha Kapoor to soar the heat with the ace designer’s masterpiece. The two became the showstopper of the show at the ramp and was looking damn hot like hell at the ramp. The show Lakme Fashion Week marks the runaway debut of Sushant Singh Rajput. Instead of being nervous for the first big fat debut, he was as hot as hell with an attitude and smile on the face. We just can’t help ourselves as to take our eyes from him. Sorry Shraddha but Sushant is the show stealer. But Shraddha also added fuel to the fire at the ramp with the black ethnic couture. She is looking damn hot. Manish chose such an unusual pair once again that stole the show in one go. Last time at Fashion Week, He had Arjun Kapoor and Jacqueline Fernandez as the show stopper pair that hit the hearts of fan. Recently he chose the dream couple Deepika Padukone and Fawad Khan to pull off his masterpiece. And this time, he made a brilliant move, choosing Sushant and Shraddha to walk at Couture Week. And he hit the arrow perfectly with the stars in his favor. Shraddha’s uniquely crafted ethnic ensemble with a western touch and Sushant is looking dapper in the alluring outfit.